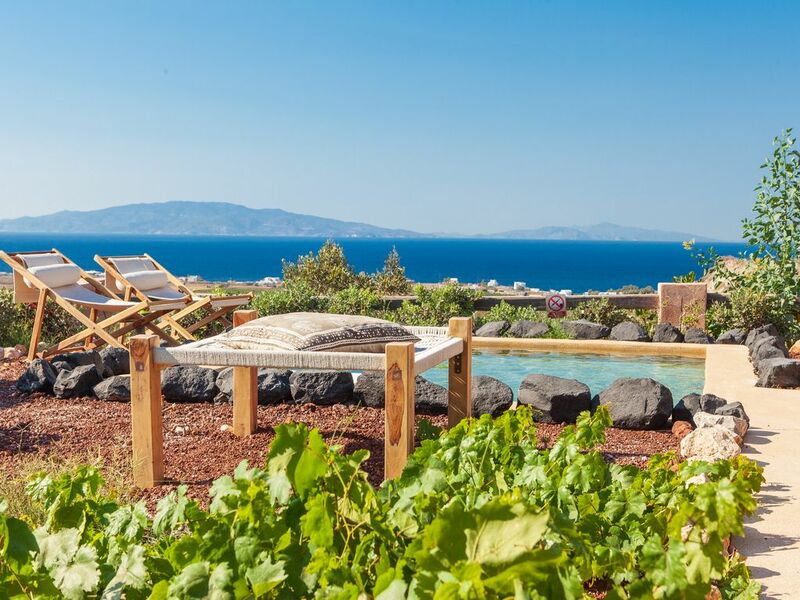 Located in Finikia, within a 40-minute walk from the the scenic Oia, Rosepepper House offers two elegantly decorated apartments overlooking the Aegean Sea and the village of Finika. This 200 sq. meters Grand Apartment is a 3 bedroom apartment designed for Families and group of friends looking for a of spacious apartment with traditional dark-wood furnishings. The particular apartment is consisting of one level and has three bedrooms and two bathrooms. A transfer from the port/airport can be arranged for the guest's convenience with extra charge. Also the manager will be welcoming and introducing you to the beauty of the island, ready to help with any suggestions or recommendations regarding your staying. Finikia is a wonderful traditional settlement just before arriving at Ia. From any entrance you may enter the village (no cars circulate in the settlement) and the pretty, small, stone-paved streets will transfer you to picturesque neighborhoods, with caved houses and small courtyards. Walking around in Finikia you can easily imagine how the settlement was, full of life, years ago. It is one of the most picturesque settlements of the island, with mild touristic development. The distance from Oia is 2,5 km the international airport of Santorini is 15km, from the port 17km and from Fira, the capital town, 10km. The nearest beaches (by car) to Rose Pepper Houses are: Baxedes and Columbos. The bus stop is only five minutes away on foot. You can also use the taxis that are available in the island. Another option, especially if you want to move freely around the island is to rent a car or a bike or and Atv. Quaint , Art Deco place. However, one bedroom was like a cave - no light , no window. However, the manager Veronica was simply awesome. Gave us tips about flights, restaurant in finikia, only manager on our trip who was so concerned about us. Thank you Veronica! Property was great and Property manager was quite helpful. A beautiful home, but too remote. This was a beautiful home with great amenities, but was too remote. We had to walk up a very long hill to get to anything. It was very hot in Santorini when we were there and the air conditioner in the house did not work. Thank goodness for the tiny pool. Upon check-out though, a new air conditioner was being installed for the next guests. We stayed here for 5 days and enjoyed every minute of it. The apartment is large, clean, well maintained and has all necessary equipment. There are plenty of options to relax inside and outside. It did easily accommodate 6 adults and even our 3-year old daughter. Veronica the manager is doing a great job making sure you are comfortable and can also provide great advise on local restaurants etc. The nearby village of Finikia offers good options to eat out and then there is Oia, of course. Generally speaking you need a car in Santorini to discover the island and also to get to the apartment. Next time we come back, we will try to stay in Rosepepper again! La maison est vraiment magnifique et très tranquille, juste à côté du village de Finikia, il est très facile d'aller à Oia à pied (30 minutes de marche). Super séjour !